A Predator welcome mat with the Wolf Bite design. This decorative 27 x 18 inch by 1/8 inch thick door mat features a latex non-skid coating on the back with black fabric piping around the edges of the mat. The welcome mat can be personalized with a name or phrase for an additional charge. 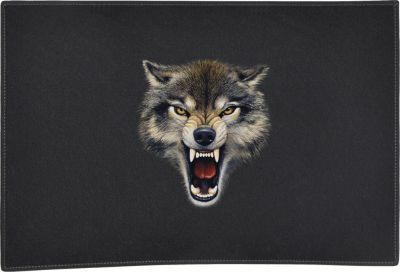 Greet all your guests with this Wolf Bite door mat! 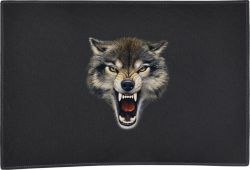 Enjoy the Wolf Bite design heat pressed on this light-weight, low pile, woven polyester door mat. This decorative welcome mat measures 27 x 18 inches, is 1/8 inch thick and features a non-skid latex coating on the back with black fabric piping around the edges of the mat. The mat can be personalized with a name or phrase for an additional charge. A great GIFT idea! To keep your Wolf Bite door mat looking great longer, we recommend Scotchguarding before use, and spot cleaning as necessary.